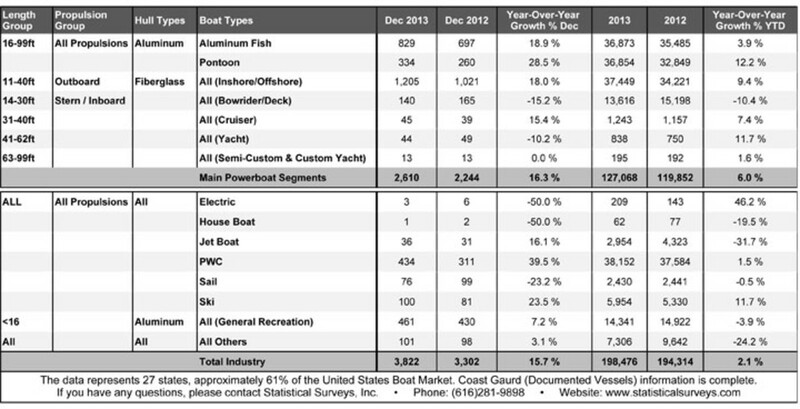 Like the stars on a professional sports team, two stalwart categories of aluminum boats and the largest segment of fiberglass boats delivered solidly higher sales in December that enabled the recreational boat industry to finish 2013 with a month of double-digit gains. Sales of pontoon boats rose by 28.5 percent, or 74, to 334, and sales of fishing boats climbed by 18.9 percent, or 132, to 829, in 27 early reporting states that represent about 61 percent of the national market, Statistical Surveys said today. For the year, pontoon sales were up by 12.2 percent, or 4,005, at 36,854, in those states and sales of fishing boats were 3.9 percent higher, or 1,388, at 36,873. Sales of 11- to 40-foot outboard fiberglass boats climbed by 18 percent, or 204, to 1,205 for the month and they were up 9.4 percent, or 3,228 boats, at 37,449, for the year. Overall, sales in the main powerboat segments rose 16.3 percent, or 366 boats, to 2,610 in December and industrywide sales climbed 15.7 percent, or 520 boats, to 3,822. Even though December is typically the slowest sales month of the year, “it’s still nice to see those double-digit gains year over year,” Statistical Surveys national marine sales manager Ryan Kloppe said. Click on the image for full sales data. Full-year sales in the early reporting states totaled 198,476 for the year, a gain of 2.1 percent from 2012, and Kloppe said that nationwide the industry is virtually assured of selling more boats this year than it did last year. In 2012, 202,403 boats were sold across all 50 states, an increase of 9.6 percent from 2011. It was the first time since 2009 that sales topped 200,000. Sales in the main segments are up 6 percent for the year, or 7,216 boats, at 127,068, in the early reporting states. Florida was the December sales leader among the early reporting states at 1,437 boats, followed by Texas (469), Louisiana (309), California (271) and North Carolina (155). Florida (1,073), Texas (434) and Louisiana (299) also led the sales list last year. Rounding out the top 10 in December this year were Arizona (143), Georgia (122), Michigan and Tennessee (each with 115) and Washington (104). Kloppe said Statistical Surveys has yet to receive any 2013 sales data from Illinois, which outsourced the production of those numbers, but after a meeting last week the company believes it will have the figures by the end of March. Sales of 31- to 40-foot cruisers rose by six in December to 45, sales of 41- to 62-foot yachts fell by five to 44 and sales of 63- to 99-foot semicustom and custom yachts were flat at 13. The Coast Guard was up to date in its reports of documented vessels, providing a complete picture of sales in the cruiser and yacht categories. Sales in all three categories were higher for the year in the early-reporting states, which Kloppe said shows that those segments are healthier than some industry observers had thought. Sales of personal watercraft rose by 123, or 39.5 percent, to 434 in December. Ski boat sales climbed by 19 to 100 and sales of jetboats rose by five to 36. Sales of sailboats fell by 23 to 76.